As is tradition around here, when I’m really excited about an upcoming super hero movie, I tend to celebrate by creating a cocktail to celebrate the character. I think my most successful cocktails have been for Wonder Woman and Doctor Strange, but I had the most fun trying to figure out a worthy cocktail for Black Panther. We’ve had our tickets to Captain Marvel since January 7, so to say I’m excited for the movie is a bit of an understatement. When I asked the Clockwatching Tart about what cocktail she thought we should make to celebrate Ms. Danvers, I told her her main colours were red, blue and gold and that the movie’s tagline was “Higher, Further, Faster”. Her immediate response was “Champagne and Cognac” because “it has a nice gold colour and is strong as heck, straight forward, and classy”. Who am I to argue against that logic? To make things interesting, we decided to try three variations of a French 75, which is Champagne and Cognac with simple syrup and lemon juice. For the first version, we went with the classic and just added a cherry for a splash of red in honour of Captain Marvel. Garnish with a lemon twist and a cherry and enjoy! The Clockwatching Tart and I found the cocktail dangerously easy to enjoy with a nice balance between the brighter notes of the lemon and the depth and complexity of the cognac. We agreed that if you ordered it at a fancy cocktail bar, you wouldn’t be disappointed. The Clockwatching Tart loves cider and recently came across a beautiful bottle of Calvados, which is French Apple Brandy. My favourite Ontario winery is Cave Springs from the Jordan area near Niagara. Their Dolomite has a beautiful limestone minerality to it that I absolutely love, so we decided to see if they would make a successful variation of a French 75. We prepared it the exact same way, but substituted Calvados for Cognac and Cave Springs for the previous Brut. While it would be great on a summer day and was nicely aromatic, it lacked the depth of the original and wasn’t quite as good. Our final variation substituted Dillon’s cherry gin for both the lemon juice and the simple syrup. 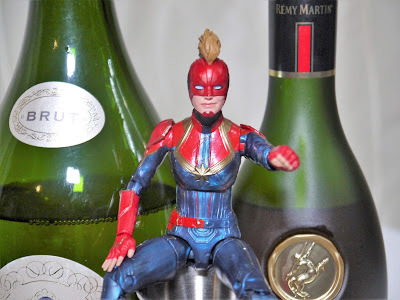 While it was a valiant effort, there was just too much going on with everything the gin brought to the table and it wasn’t worthy of Captain Marvel (or our palettes). In the end, there was only one drink worthy of the Higher, Further, Faster name (and inclusion in our regular cocktail rotation): the original French 75 with a cherry. Cheers to Brie Larson and her fight for underrepresented voices and to Captain Marvel laying waste to the box office and all the trolls.